Stallion manager Richard Barry and trainer Bob Baffert with American Pharoah the day he arrived at Ashford Stud, Versailles, Kentucky. Photo courtesy of Coolmore. In the year since winning the Triple Crown and 2015 Breeders’ Cup Classic, American Pharoah has received international accolades, moved to Coolmore’s Ashford Stud in Kentucky, there are over 100 little Pharoahs on the way, and his biography was a best seller. Not bad for the genial bay colt. Part of American Pharoah’s popularity is due to his accessibility. When he worked out, fans were at the track at dawn to watch the colt. When Pharoah had a bath, snaps of him covered in bubbles streamed though social media. These days, special tours bring his fans to meet-and-greets at Coolmore. While racing, Pharoah’s followers were welcomed into his realm. The colt patiently posed for selfies, with carrots his currency. Pharoah’s gentle amiability allowed fans to get close enough to feed him those carrots, without the mayhem or mischief commonly exhibited by 3-year-old colts. American Pharoah’s breeder-owner Ahmad Zayat negotiated American Pharoah’s career as a stallion during the Triple Crown campaign. The deal struck was after his racing career, Pharoah would transfer to Coolmore at Ashford Stud in Versailles, Kentucky. “The level of interest in American Pharoah is unlike anything we have seen in the past. We are very fortunate to have had a lot of great horses retire to Ashford over the years but interest mainly comes from within the industry. It’s the offseason at the moment, so American Pharoah’s days are pretty quiet. The stallions are given a grain feed early in the morning by the night person – before our stallion staff arrives at 6.30 a.m. The stallions all have their own paddocks and they are turned out as soon as our staff arrive. We don’t ride any of our stallions, but if they need some extra exercise they are lunged for around 10 minutes in one of our lunge rings. The stallions spend all morning outside and are brought in before lunch. They all get groomed and then are available for our clients to come and view. 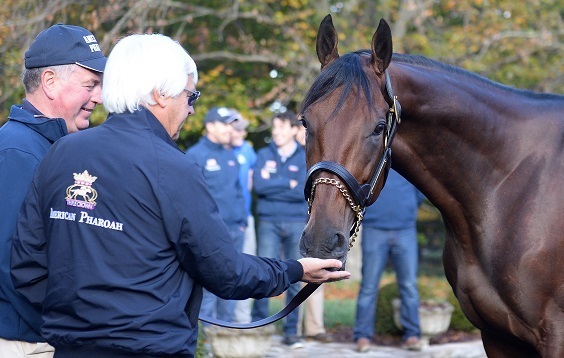 At 2.30 the Ashford Stud tour takes place and American Pharoah is obviously one of the highlights. The tours are booked through Horse Country Inc. and run Monday to Friday for 25 people. The stallions get their evening feed around 3 p.m. and are bedded down for the evening. All the stallions have cameras in their stalls so they are monitored around the clock, when our day staff leave and night watch begins. (Above, Untouched Talent in foal to American Pharoah. likely deliver one of Pharoah’s earliest foals in 2017. The Merck Veterinary Manual says the average gestation for a mare ranges from 335 to 342 days. Anyone who has waited for a foal to be born knows that mares ignore published guides and foal when they are ready – sometimes weeks early, many times weeks late. Coolmore purchased Untouched Talent in 2012 for $5 million at Fasig-Tipton’s Fall Sale. Her price, a sizeable sum, reflects the success of her first foal, the Grade 1 stakes winner Bodemeister. As a sire, Bodemeister is proving popular in the sales ring and has runners competitive at the graded stakes level. Untouched Talent is the dam of Bodemeister who won the G1 Arkansas Derby and was 2nd in the Kentucky Derby. Bodemeister is by American Pharoah’s grandsire Empire Maker so the resulting foal will be closely related to Bodemeister. While we don’t know for sure if she will be the first to foal we expect her to be one of the early ones. Starting in January, expect to see streams of Pharoah foals on racing social media. 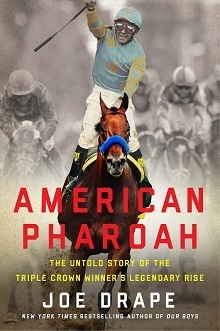 Joe Drapes’ American Pharoah: The Untold Story of the Triple Crown Winner’s Legendary Rise embeds the reader in the ascent of American Pharoah – from his days as a foal to his transformation into racing icon. Drape is an Eclipse Award-winning reporter for the New York Times who covers the horse racing beat. years – winning the Triple Crown, and, to do what had never been done before – winning the Triple Crown and the Breeders’ Cup Classic. When did you go live covering AP for the book? I covered the Triple Crown for the paper (New York Times) and had no intention of writing a book – frankly because I did not think he would the sweep the series. When he did, I went back and re-reported it with the goal being why was his horse different than the eight previous one’s I saw fail, and who had a hand in his development. Were you embedded with the AP camp? What kind of access? No, embed. Regular access. In fact, my coverage was at odds with Baffert and Zayat for most of the last seven years. But we have all dealt with each other pretty much professionally, meaning they continue to answer my questions. What’s your takeaway from covering such a momentous campaign? You need an extraordinary athlete, which AP was and was identified as such as a weanling. You need a ton of luck, which he got beginning with banging his ankle on the way to the Saratoga Yearling Sale where he failed to be sold. Knowing what I know about how much talent, luck and magic is required now, I can see why we waited 37 years for a Triple Crown.